Channel 4 in talks to buy Champions League football matches from BT | What Hi-Fi? Bidding wars for live football rights are always a ferocious affair, with Sky and BT pledging millions to try and outbid each other. But this year there's been a surprising new entrant to the fray: Channel 4. According to The Telegraph, the terrestrial broadcaster is in talks with BT about subletting one game per match-week to show on free-to-air TV. Such a move would be unprecedented and would bring the tournament's live games back to terrestrial TV (they were formerly shown on ITV). 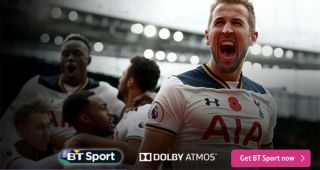 At present, BT Sport holds the exclusive UK live rights to all UEFA matches, including the Champions League and Europa League, with both available to watch in 4K Ultra HD. The deal - struck in 2013 - took the Champions League away from terrestrial TV for the first time. However, BT showed the final live for all Freeview customers on its BT Sport Showcase channel and broadcast it live on YouTube for free in 2016. The auction for Champions League rights ends on 1st March 2017. The rights for the tournaments between 2018 and 2021 are up for grabs. Considering BT's winning bid in 2013 was over £900 million, this year's winning bid could top £1 billion for the first time.